There are many beautiful bird species that soar through Nebraska’s skies. And then there’s the turkey vulture, with a face only a mother could love. To be fair, the turkey vulture’s plumage, while drab, is not unattractive – it’s the bird’s beady eyes and bald, red head (which resembles that of a wild turkey, hence its name) that are hard to like. Add in its seemingly disproportionally smallness compared to the rest of the body and it’s easy to see why its head adds nothing to the bird’s attractiveness. It does, however, serve the bird’s lifestyle well – you see, a feathered head would collect pieces and parts of dead deer, raccoons or whatever carcass it was sticking its head in at dinner time, possibly resulting in infection. Yes, the turkey vulture’s preferred meal is a nice, ripe body. Yet another reason to not love this bird. However, even if you don’t like their feeding habits or appearance, you have to appreciate the turkey vulture’s flight skills and you may have more opportunity to watch them in action in the years to come, as their numbers are growing rapidly, both here and elsewhere. But that could lead to problems, too. Some will be real, such as large numbers of roosting birds making a mess on homes, yards, businesses and the like. Others will be people just not wanting this ugly bird around. The turkey vulture (Cathartes aura) is the most widely distributed of the seven vultures found in the New World, its range extending from southern Canada to the tip of South America. Most of the United States, including Nebraska, is included in the species’ summer breeding range. Depending on the weather, turkey vultures arrive in or migrate through Nebraska in March or April and stay through October or November. Those birds head south for the winter, some as far as Central and South America. Some turkey vultures are year-round residents of the southeastern U.S., from Texas to New York, a range it shares with the black vulture. Other New World vultures include the endangered California condor and the yellow-headed vulture of Mexico and Central and South America. Turkey vultures are similar but unrelated to 15 species of vultures found in the Old World. While they have similarities to both, their relationship to hawks and storks is still debated. Dark brown in color apart from the silver to white trailing edge on the underside of its wings, turkey vultures measure two to three feet in length and weigh five to six pounds. They make the most of their six-foot wingspan and are masters of soaring flight. Other than during takeoff and landing, they rarely flap their wings, which cant upward slightly. While cartoons and Westerns might lead you to believe that groups of circling vultures are homing in on their next meal – maybe even waiting for it to die – it’s more likely the birds are riding thermals or updrafts to gain altitude, a common behavior called kettling. Thermals are columns or bubbles of rising air created by the uneven heating of the ground by the sun, especially in the morning. They often form over bare ground, city buildings and parking lots or hills facing the sun. Updrafts are caused by a hill or building deflecting wind upward. Once at the desired height, vultures can glide at speeds of up to 60 mph to their next stop or source of lift. Turkey vultures use this climband- glide flight sequence to fly for hours without flapping their wings, teetering from side to side to stay on course. They can complete their entire migration, which takes some 5,000 miles from British Columbia to Venezuela, in the same fashion. One study documented a vulture covering approximately 100 miles a day for six days. Due to the lack of thermals, they typically avoid crossing large water bodies and don’t often migrate on rainy or overcast days. While vultures may rise to altitudes of nearly four miles to fly over storms, they typically fly at 2,000 feet while migrating. Vultures’ soaring flight is also used in their search for food. Like their relatives, hawks and eagles, turkey vultures have excellent eyesight and sometimes locate meals with their eyes. Because they aren’t equipped with sharp talons that are capable of killing prey, however, they feed almost exclusively on carrion, using their highly developed sense of smell (a rare trait in the bird world and among the best of them all) to detect even the slightest trace of the scent of death while gliding at lower levels. In a study done in Panama, turkey vultures found 71 of 74 chicken carcasses within three days, with no difference in the time took to find leafcovered birds under the forest canopy to those in the open. 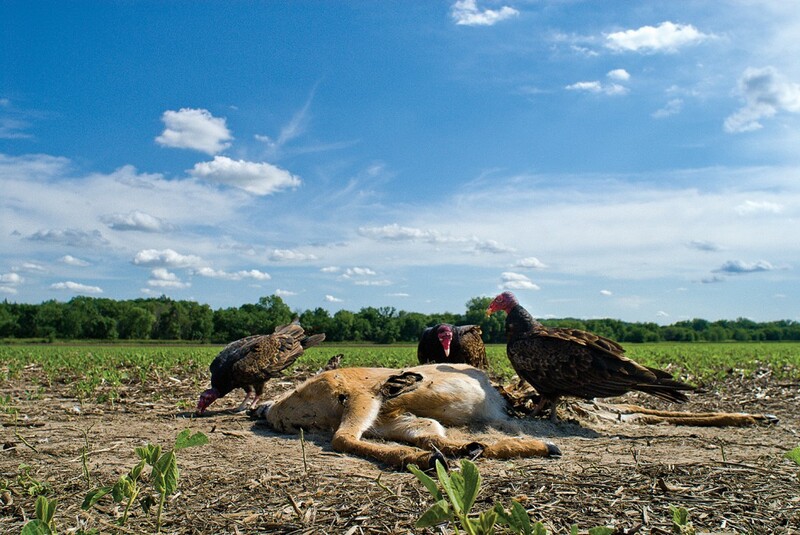 The vultures did not easily locate fresh kills, but found most within a day. Studies have shown vultures prefer fresh meat but, because they lack a beak strong enough to tear the thick skin of larger mammals, often must wait until their meal is softened by decomposition or opened by coyotes, opossums or other scavengers. Turkey vultures feed primarily on mammals, ranging from mice to large ungulates. They are opportunistic, however, and will also eat birds, fish, mussels, reptiles, amphibians, insects and even animal feces or rotting pumpkins. They also prefer to eat herbivores, avoiding dogs, coyotes and other carnivores. Many may gather at a carcass, but typically only one feeds at a time, making others wait their turn. While deemed disgusting by some, the birds are praised by others as part of nature’s “cleanup crew.” Its common name comes from the Latin word vellere, which means to pluck or tear. In its scientific name, Cathartes means purifier, and aura means air or the breeze. One study found that the stomach acid of a turkey vulture kills the bacteria responsible for such diseases as botulism, anthrax, cholera and salmonella, and that their feces were free of these pathogens. So by cleaning up carrion that would otherwise be consumed by maggots, bacteria or other scavengers, vultures may actually help curb the spread of disease. 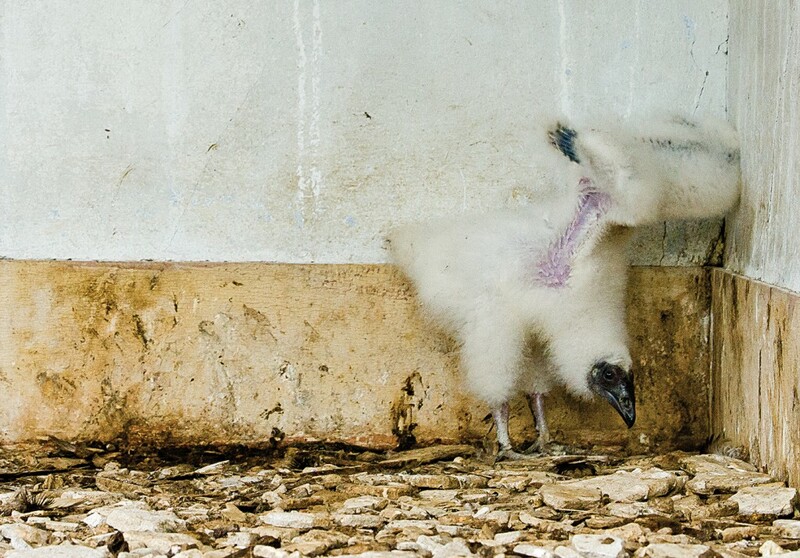 Vultures are believed to mate for life, but don’t build a nest. Instead they lay their eggs in or on whatever surface they might find in a variety of dark recesses, including rock ledges, hollow trees or logs, caves, animal burrows and abandoned hawk or heron nests or buildings. Most clutches contain two eggs, dull white with tan, brown or purple blotches. Both adults share incubation, which begins when the second egg is laid and can last 28 to 41 days depending on the temperature of the nest site. Young weigh about two ounces when hatched and are covered with white down, except for their dark gray faces. The adults also share in brooding and feeding, regurgitating well-digested food for the young. Young fledge at 60 to 84 days, their heads still gray. They spend a few weeks perching and roosting at the nest site, still dependent on their parents for food. That dependence is short lived, although young may continue to follow adults on foraging flights once they leave the nest site and join the communal roosts. Found throughout Nebraska, vultures typically inhabit areas where forest meets open grassland or farmland, providing trees for perching and roosting and areas where carrion may be present. While they don’t have a voice box like other birds and communicate only in grunts and hisses, they are social. Vultures gather in communal roosts at night, with numbers ranging from a few to a 100 birds or more, even thousands in some southern locales. Large cottonwoods or pines are common choices for these roosts, but transmission towers are also used. Vultures don’t often leave the roost until a few hours after sunrise, when the air has warmed and thermals can be found. If undisturbed, vultures may use the same roosts year after year. Vultures sometimes roost in cities, putting them at odds with those who live below them and don’t appreciate the whitewashing caused by their feces. 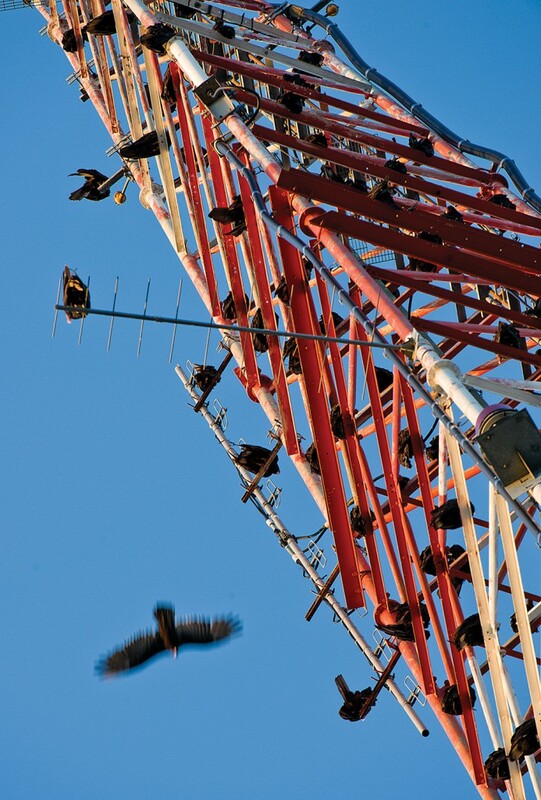 In recent years, Nebraska Game and Parks Commission and USDA Wildlife Services biologists have responded to an increasing number of complaints from communities across the state about vultures roosting on radio, television, phone and water towers, grain elevators, and in treetops above homes and even a cemetery. One flock of vultures moves from roost to roost in a southwestern Lincoln neighborhood. Some of the roosts are on large lots and not directly above homes, thus are mostly tolerated by the homeowners. Other roosts, however, turn rooftops and back yards into bombing ranges. Some homeowners bang on pots and use other noisemakers in hopes of scaring the birds away. While the birds are protected by the Migratory Bird Treaty Act, all are legal methods of hazing. Other deterrents found to be effective and used elsewhere include spraying the birds with water, even using motion activated, rooftop-mounted sprinklers, “shooting” the roosting birds with red or green laser lights, or hanging an effigy in the roost. Scientists aren’t certain why this works, but the sight of a dead vulture hanging by its foot has proven effective enough that replicas of dead vultures are being commercially produced and sold. 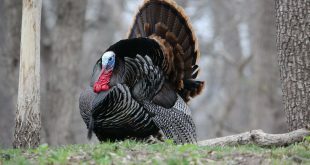 Tom Welstead, district wildlife manager in the Commission’s Norfolk Office, found the effigy doesn’t even need to be a vulture – in response to a Blair homeowner’s complaint about roosting vultures, he hung a tattered, broken wild turkey mount by its foot in a roost tree and was able to convince the 30 or so vultures using it to find a new home. The need to haze vultures is growing with their population. The annual North American Breeding Bird Survey, which uses June bird counts to track the status and trend of bird populations, shows an average annual increase of 11 percent in turkey vulture numbers in Nebraska from 1967 through 2010 – among the highest rates in the nation and five times the rate of increase nationally in the same time frame. Welstead has watched turkey vulture numbers grow in his 30-plus years with the Commission. “I grew up down in southeastern Nebraska and I don’t remember ever seeing turkey vultures,” he said. “I went off to college in Colorado and when I came back in ’76, that’s when I noticed my first one.” Now he sees them throughout the territory he manages and throughout the state as well. “I think their numbers have just grown exponentially,” said Welstead. The first turkey vulture complaint Welstead received came in the mid- 1980s from the Genoa area, where birds were nesting in an abandoned barn and the landowner “didn’t like them being there because of the smell.” It wasn’t until early in the 2000s that he received the first complaint related to a vulture roost in northeastern Nebraska. 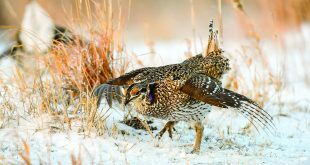 Jorgensen said only a handful of bird species are increasing as much as turkey vultures, including wild turkeys and Canada geese, which have also become a nuisance in some cases. Several factors could be contributing to the increase in turkey vulture numbers. The protection of the 1918 Migratory Bird Treaty Act was the first, ending most of the trapping, shooting and poisoning that had been occurring based on unfounded beliefs that turkey vultures preyed on newborn, young or weak livestock, and spread disease. While this continued into the mid- 1900s in places such as Texas, where ranchers killed more than 100,000 turkey vultures in the early- to mid-1900s, the population rebounded elsewhere between 1920 and 1940. 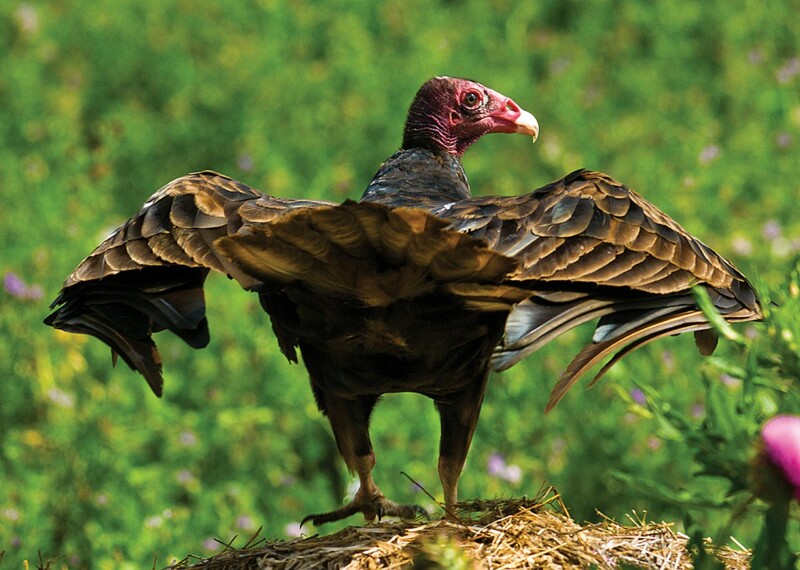 The widespread use of DDT and other organochloride pesticides following World War II led to local and regional declines in turkey vulture numbers. DDT made its way through the entire food chain and affected many bird species, especially raptors, by reducing the thickness of egg shells and nesting success. Turkey vulture populations began to rise soon after it was banned in 1972. Some believe the increase in deer populations and the number of vehicles on highways is also helping turkey vulture numbers, as the combination usually means more road kill for vultures to dine on. Were road kill not apt to be frozen part of the year, vultures might be year-round Nebraska residents. That said, the northern edge of the turkey vulture’s winter range is creeping northward, a byproduct of climate change. Whatever the reason, the turkey vulture population increase is real and could very well continue. Which means there will be more opportunities for people to watch a kettle of soaring vultures, roadkill won’t linger on the roadside as long and people will need to learn how to live with the roosting birds or how to get them to move on. NEBRASKAland Regional Editor Eric Fowler was born in Hastings, graduated from Ogallala High School in 1988 and earned his Bachelor’s degree from Chadron State College in 1993. After six years as a writer and photographer with newspapers in Chadron and Scottsbluff, he joined the Commission in 1998 as Publications Editor and has been a member of the NEBRASKAland staff since 2001. 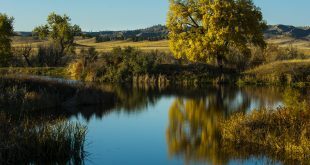 He has won numerous awards from the Association for Conservation Information for writing and photography featured in the magazine. Fowler enjoys spending time outdoors with friends and family, including his son. 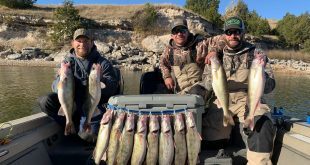 His passions include hunting waterfowl, upland and big game, fishing, especially in the Sandhills, hiking, camping and watching the sun rise or set anywhere in Nebraska.